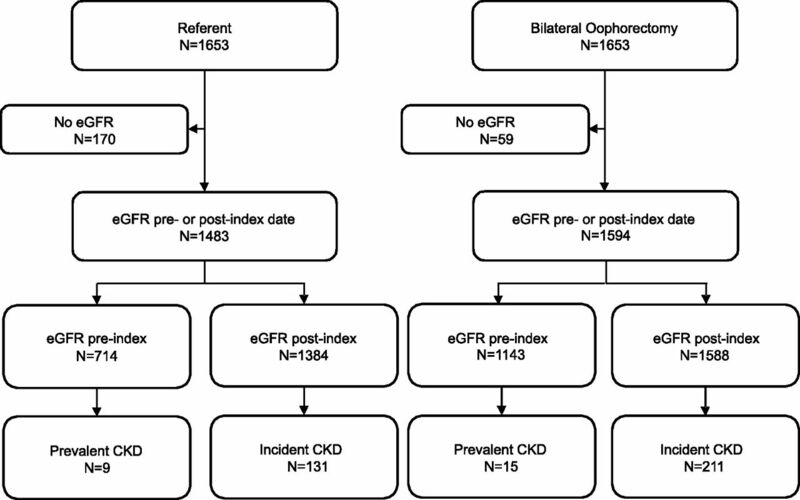 Incident CKD defined using eGFR values was more common in women who underwent bilateral oophorectomy. Plasma or serum creatinine (Cr) tests were extracted from the Rochester Epidemiology Project electronic indexes (available back to 1994 from the Mayo Clinic and back to 1998 from the Olmsted Medical Center). eGFR was calculated from Cr values using the Chronic Kidney Disease Epidemiology Collaboration equation. CKD was defined as eGFR values <60 ml/min per 1.73 m2 on two occasions >90 days apart. CKD present at the index date was considered prevalent, and CKD that developed on or after the index date was considered incident. Higher cumulative incidence of CKD by eGFR-based criteria (upper panels) and adjudicated diagnostic codes (lower panels) in women who underwent bilateral oophorectomy. Cumulative incidence curves estimated using the Kaplan–Meier method and adjusted using inverse probability weights are shown in red for the bilateral oophorectomy cohort and black for the referent cohort. 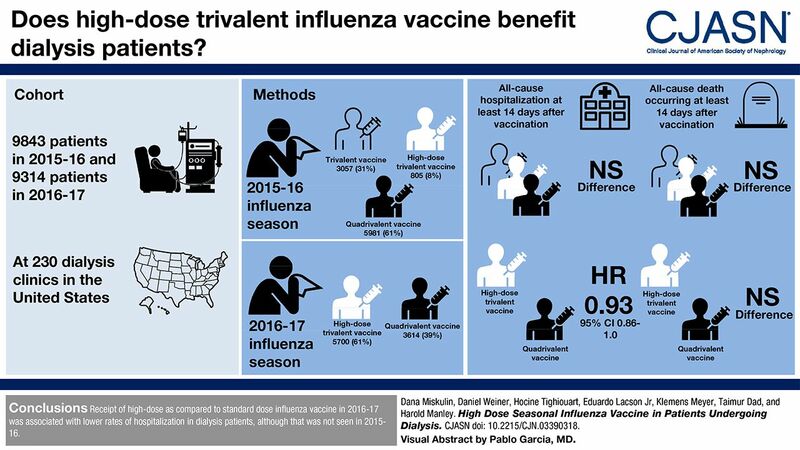 The hazard ratios (HRs) and corresponding 95% confidence intervals were calculated using Cox proportional hazards models with age as the timescale and adjusted using inverse probability weights. Analyses are shown overall (left panels), for women age ≤45 years old at the index date (center panels), and for women age 46–49 years old at the index date (right panels). 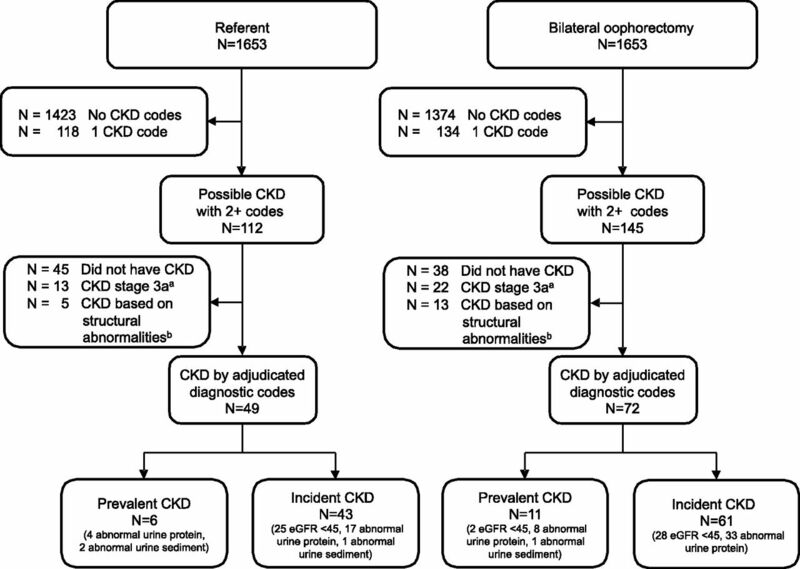 Incident CKD defined using adjudicated diagnostic codes was more common in women who underwent bilateral oophorectomy. The electronic indexes of the Rochester Epidemiology Project were screened for a list of International Classification of Diseases (ICD) diagnosis codes for CKD (ICD-8 or ICD-9). The medical records for all women with at least two of these codes separated by >30 days were then reviewed by a nephrologist. CKD was defined as an eGFR<45 ml/min per 1.73 m2 or evidence of kidney damage (proteinuria or active urinary sediment) on at least two occasions >90 days apart. CKD present at the index date was considered prevalent, and CKD that developed on or after the index date was considered incident. aWe excluded CKD stage 3a, because it often went undiagnosed by the care providers. bStructural abnormalities without evidence of kidney dysfunction were not included (e.g., atrophic kidney, medullary sponge kidney, hydronephrosis, and partial or complete nephrectomy). IQR, interquartile range; BMI, body mass index; —, not applicable. ↵a Women with prevalent CKD defined using eGFR were excluded from this table (nine referent women and 15 women who underwent bilateral oophorectomy). ↵b In the regression models used to derive inverse probability weights, women with unknown education were assigned to the ≤12-year group, and women with unknown BMIs were assigned to the <30-kg/m2 group. ↵c The indication was listed by the gynecologist in the medical record at the time of oophorectomy. Benign conditions include benign tumors, cyst, or endometriosis in either ovary. No ovarian indication includes women without a benign ovarian condition in either ovary. Historically, the terms “prophylactic,” “elective,” or “incidental” oophorectomy were used; however, we avoided these terms. ↵d The indication was listed by the gynecologist in the medical record at the time of hysterectomy. Each woman may have more than one indication recorded. 95% CI, 95% confidence interval; ET, estrogen therapy. ↵a Hazard ratios were calculated using Cox proportional hazards models with age as the timescale and adjusted using inverse probability weights derived from a regression model including 17 chronic conditions present at baseline, years of education (unknown, ≤12, 13–16, or >16), race (white versus nonwhite), body mass index (unknown or <30 versus ≥30 kg/m2), cigarette smoking (current or former versus never), age at baseline (continuous), and calendar year at baseline (continuous). These adjustments were performed separately in each stratum to maximize the balance at baseline. None of the interactions by age were significant. ↵b Absolute cumulative risk at 20 years after bilateral oophorectomy (or index) calculated using the Kaplan–Meier method. The estimates were adjusted using inverse probability weights derived from a logistic regression model including 17 chronic conditions present at baseline, years of education (unknown, ≤12, 13–16, or >16), race (white versus nonwhite), body mass index (unknown or <30 versus ≥30 kg/m2), cigarette smoking (current or former versus never), age at baseline (continuous), and calendar year at baseline (continuous). These adjustments were performed separately in each stratum to maximize the balance at baseline. ↵c Women who were taking ET on their 46th birthday after bilateral oophorectomy (only oral or transdermal). Women who developed CKD before their 46th birthday, died or were lost to follow-up before their 46th birthday, or had not reached age 46 years old as of December 31, 2014 were not included in the corresponding analysis. Follow-up for these analyses was started at age 46 years old. None of the interactions by ET were significant in the ≤45-years-old age stratum. ↵d Women who were taking ET on their 50th birthday after bilateral oophorectomy (only oral or transdermal). Women who developed CKD before their 50th birthday, died or were lost to follow-up before their 50th birthday, or had not reached age 50 years old as of December 31, 2014 were not included in the corresponding analysis. Follow-up for these analyses was started at age 50 years old. None of the interactions by ET were significant in the 46- to 49-years-old age stratum. ↵e Excluding women with oophorectomy or index date before January 1, 1994 and women with no serum creatinine measurements available. 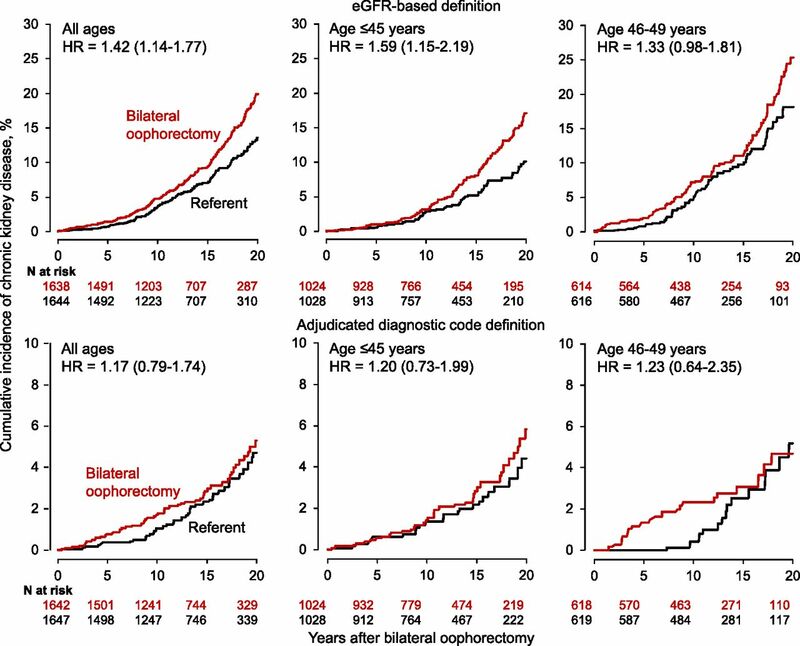 ↵f The absolute risk was reported at 15 years after bilateral oophorectomy (or index) rather than at 20 years, because the follow-up was shorter. ↵g Excluding women with any of the 17 chronic conditions at the index date or with onset of CKD defined by eGFR or adjudicated diagnostic codes before the index date. ↵e Excluding women with any of the 17 chronic conditions at index date or with onset of CKD defined by eGFR or adjudicated diagnostic codes before the index date.